On a beautiful afternoon Yasmin and Richard gathered with their family and friends for the wedding of their dreams. 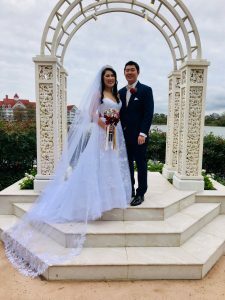 There in the Walt Disney World Wedding Pavilion in Orlando, Florida, they took their vows, exchanged wedding rings, and became husband and wife. Sara From Disney Fairytale Weddings made sure that every detail, no matter how small, was taken care of. The Disney Florist created a beautiful bouquet of white garden roses, red roses, and seeded eucalyptus for the bridesmaids and boutonnieres for Richard and his groomsmen. Disney Fine Art Photography captured every moment of the couple’s day. From getting ready pictures in their rooms at the Grand Floridian and pictures on the grand staircase in the lobby, to their beautiful ceremony in the Wedding Pavilion, and back to the Grand Floridian for the reception. Rev.Glynn Ferguson with Sensational Ceremonies worked with Judy and Thanh to create a one-of-a-kind custom ceremony for the two of them. The ceremony was fill with laughter and tears of joy as they recited the vows they had chosen for one another. They even took Rev.Glynn up on his homework assignment (to write and say why they love each other.) Judy wrote: In 2007, I met Richard Li for the first time. He had recently moved to Michigan from Texas, and I had actually mistaken him for a foreign exchange student at the beginning because he was so quiet and shy (boy was I wrong!). We soon developed a wonderful friendship full of smiles, laughter, and many inside jokes. I remember going home from school everyday, excited to sign into AOL instant messenger just so we could talk and catch up on whatever day we were having. It was all very platonic, and we both actually used to help each other out with with advice when it came to crushes on other people! I’m not exactly sure when it started to change, but somewhere within the next two years, our friendship began to develop into something more. I love Richard because he’s basically been my best friend and partner throughout the past decade. We’ve both been through so many years together, both basically growing up with each other. When we first met, he was still shorter than me and his voice was still semi-squeaky. We were great friends first for two years, and I would like to believe that this is one of the reasons why our relationship is so strong, because it was already strong before “we” were even a “we”. From all the late night jokes and conversations, to being each other’s first prom dates (two years in a row), first kiss, high school graduations, college acceptance letters, moving, surviving those awful “finding yourself” early twenties, college graduations, career choices, and more…the fact that we’ve gone through life’s most important milestones together and have never once gave up on each other, always supporting one another and keeping each other grounded is in my opinion, absolutely beautiful. We both chose each other time and time again, and at the end of every day, it’s his hand that I want to hold through anything life throws at me. I love Richard because he never gave up on us. In the earlier years of our relationship, whenever we would fight, I would always want to take the easy way out by taking a break. However, Richard always fought for us and never gave up. No matter how much I pushed him he always held me close and never waivered in the fact that he knew we both loved each other. I love Richard because he never let me give up on myself. I had a very difficult couple of years where I was in a very dark place, and I can only imagine how hard it must have been to be in a relationship with me at that time. Richard never gave up on me, and through his constant support I began to see myself through his eyes and realized my worth. I love how he always brings out the best in me. He has allowed me to find myself by watching me go through many stages of life, guiding me and supporting me every step of the way. He helped me find the confidence in myself that I thought never existed there. I love Richard because we are both so different but so similar at the same time. We both have a similar sense of humor, family morals, goals in life, and enjoy most the same hobbies (although I will never understand sports). We both enjoy trying new foods, going to the movies, playing video games and lazying around. However, we are very different at the same time, and I believe this is one of the most beautiful parts of our relationship. We compliment each other. Where he tends to take days one day at a time, I like to plan out everything. I help him learn responsibility while he reminds me to relax. While I am a huge introvert, Richard is so full of life. He is literally the brightest light in any room. I love Richard because he knows me inside and out. He knows all my facial expressions and what each of them entail about what I’m thinking in that exact moment. He can predict my reaction for almost any situation, and still finds it either extremely cute or hilarious. Even when I get grumpy, he just laughs at me and gives me the biggest bear hug to cool me off because he knows this works 9/10 times. He’s seen me in my best and worst moods, but he continues to show me constant love. I just want you to know that I have never been more confident in any decision that I have ever made. You are an incredible person. Truly beautiful inside and out. I love you not only because you are the most selfless, compassionate, and caring person I have ever known, but also, I love your heart melting pout, your obsessions with puppies and Disney. We have grown up together, but never apart. And with you, I will always be young at heart because you allow me to be me. After today, we will embark on the next chapter of our lives together. I may not be perfect, but I promise to kill the spiders when you scream for help and share my fries when you’ve already finished yours. I will do my best to make you happy for the rest of your life. And I will be happy for the rest of my life because of you. Before they ever got to Florida, the couple had been working with Married by Mail to get their Florida Marriage License. It was personally delivered to their officiant for their wedding day.